Listen to the radio story - Part 1. Theories abound about why the violins created in Cremona, Italy from the mid 1500s to the mid 1700s serve as the benchmark among masterpieces. Intriguing research by acoustics experts from the Massachusetts Institute of Technology might provide a clue. Listen to the radio story - Part 2. First, the scientists calculated and plotted the acoustic properties of the sound holes in the violin’s ancestors. Then they analyzed the f-shaped sound holes in hundreds of violins created during golden age of violin making when the Amati, Stradivari, and Guarneri families operated their famous workshops in Cremona. WRTI’s Meridee Duddleston learns that there’s more to a Stradivarius than we commonly hear. Radiated Power. Air resonance frequency. F-hole length. Sound familiar? The researchers’ calculations reveal that sound-hole shape from the 10th to 18th centuries went hand-in-hand with an evolution towards greater acoustical power, or fullness of sound. And during the golden age of violin making that trend continued. Music and the science of sound intersect in an MIT study. WRTI’s Meridee Duddleston has more. 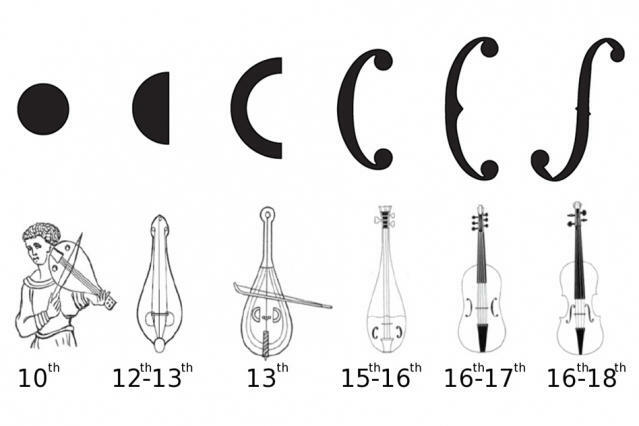 Meridee Duddleston: Amati, Stradivari, Guarneri – A research team from MIT measured and plotted changes in the f-shaped sound holes of the instruments crafted by these noted families during the golden age of violin making. But the impetus to collect data on the acoustic properties of f-shaped holes in hundreds of violins crafted in the 1500s to 1700s started with the gentle sound of the lute – its 10th-century predecessor. Professor Nicholas Makris teaches acoustics at MIT and is an expert on sensing sound. He also plays the lute. An analysis of its acoustic properties revealed the beautiful carvings over the lute’s lone, round sound hole have just a negligible effect on its power...but the research got him thinking. Nicholas Makris: I just happened to notice a Renaissance songbook that a friend had left at the house, and it had a picture of a Renaissance instrument that was an ancestor of the violin - and it had a c-shaped hole in it. And I started to wonder – well that’s interesting, it’s not an f-hole it’s a c-shaped hole. And I thought there possibly could be an evolution. MD: And so Makris and a team calculated the air flow, and other sound attributes emitted from sound holes of the past relatives of the violin when sound holes went from round to semi-circular to more narrow c-shaped holes, and eventually the f-shaped hole. NM: And the process led to a slendering - where for the same amount of area that you cut from the sound hole you would have greater perimeter and less void area - meaning less acoustically inactive area, where there wasn’t much air flow, because the air was coming mostly from the perimeter. MD: And the evolution of the sound hole into a narrow opening with a more extensive edge area – helps facilitate the astounding sound we hear today. Here's the MIT study for those of you who can tackle academic papers! The striking power of a violin’s sound creates magic with many sides. WRTI’s Meridee Duddleston looks at just one. Meridee Duddleston: Is it the wood, the thickness of the back, the front, the precise space inside, or the shape of the sound hole that defines the coveted status of a Stradivarius violin crafted in the early 1700s? No one knows the secret. But MIT acoustics professor Nicholas Makris has discovered one thing that likely contributes. Makris studies sound. He - and a team of researchers - focused their expertise on the f-shaped sound-holes found in the violins crafted by the Amati, Stradivari and Guarneri families centuries ago in Cremona Italy. Nicholas Makris: What we found, if you looked at the evolution of the f-hole length, is that it was gradually increasing. Even in the Amati period, there were three generations of Amati, and you find the f-hole is gradually over the centuries getting longer and longer. Over the Stradivari period it actually stayed relatively stable. And then in the Guarneri period evolved and became much longer again. MD: Makris says sound concentrates on the edges of a sound-hole, like wind shooting down the side of a skyscraper. 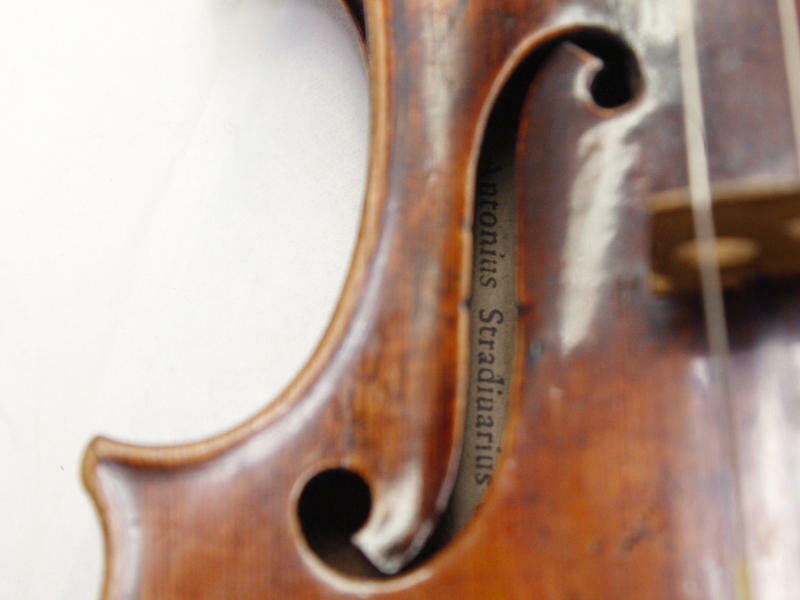 The narrow f-shaped holes really have more perimeter than the violin’s ancestors – a trend that continued over the 200 years the families from Cremona were at work. NM: And there’s about a 30% increase in the f-hole length over that 200-year period, and we’ve calculated that’s about a 60% increase in power or air resonance that’s a result of that. MD: And so perhaps physics explains part of the magical power we’ve come to know. In a quaint, historic building on Philadelphia’s Locust Street, just a few doors down from the Curtis Institute of Music, David Michie restores and sells violins and bows, drawing virtuoso musicians from far and wide. WRTI’s Meridee Duddleston paid a visit to this master craftsman. Master violin restorer and dealer David Michie recounts how renowned French archetier (the French term for bow maker) Eugene Sartory policed the market for counterfeits of his work. Michie also provides some advice on choosing a bow in these excerpts of an interview with Meridee Duddleston. Michie has much to say about the importance of a high-quality bow. "What the Italians were to string instruments, the French were to bows," he explains. In the 1800s, large blocks of wood from the pernambuco tree were used as ballast in ships making their way from Brazil to France. And Francois Tourte, who developed the modern bow and is considered the “Stradavarius of bow makers,” took to the wood and started using it. Pernambuco is now an endangered species whose export is restricted. Although carbon fiber and other substitutes are now in the mix, Michie says nothing beats a bow made of pernambuco wood from Brazil.